Every so often, news of a stunning new instrumentalist creates a buzz in the music business long before the public at large has had an opportunity to experience the latest discovery first-hand. Francesco Libetta's name began circulating among the piano cognoscenti after his astonishing traversal of Godowsky's fifty-three studies based on Chopin's Études. Only one pianist before had played these notoriously difficult pieces (described by one critic as a "monster corpus") in their entirety in concert; Libetta was the very first to play them all by memory. Though his performances of the work were confined to Italy, word spread quickly of a new pianist with a superhuman technique wedded to an innate, elegant musicality. Musicologist and Godowsky biographer Jeremy Nichols called Libetta's performances of the Chopin/Godowsky studies "Stunning! I never thought I'd hear such mesmerizing performances of these pieces in concert." Libetta's distinguished compatriot Aldo Ciccolini describes Libetta as "the most talented instrumentalist of his generation," while critic Eric Schoones has called him "the reincarnation of Dinu Lipatti." The subject of these accolades was born in 1968 in Salento in the "heel" of Italy. Libetta's early studies were not confined to piano. He also excelled in composition and orchestration and has most recently taken up the baton to conduct performances with the Balleto del Sud in southern Italy. His range of interests led the noted Italian critic Alfredo Mandelli to credit Libetta with "a breadth of knowledge that extends far beyond the world of music and the piano repertoire." Though Libetta's initial acclaim resulted from his seemingly effortless performances of "impossible" pyrotechnical works, his repertoire encompasses a wide scope, including all of Beethoven's 32 Piano Sonatas, several concerti of Mozart and Beethoven, as well as major keyboard works by Schubert, Schumann, Chopin, Debussy, and Ravel. 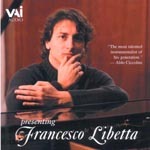 Libetta's American debut took place in 2000 as part of the Miami International Piano Festival of Discovery. It is that concert which is presented here, the first of a series of recordings and videos of Libetta which will be released on the VAI label. In the words of critic John Ardoin, "Of the new generation of pianists, Francesco Libetta is the most inspired and creative. Definitely the one to watch." VAI is proud to be associated with this most distinguished young artist.